Signbo­ards at the border crossi­ng now have markin­gs in Urdu, Englis­h, and Hindi. While the relaxed visa regime may have been put on hold by India, Pakistan has stepped up measures to make the border crossing at Wagah easier by incorporating the Hindi script in them, The Hindu reported on Friday. Both countries had approved relaxed visa regimes last year which would have allowed Pakistani businessmen to travel to up to five cities with relaxed provisions for the mandatory police reporting. Furthermore visitors over the age of 65 would be able to get a 45 day on arrival visa. The new visa regime was suspended a day before it came into effect in January following clashes along the Line of Control. Signs at the border checkpost have now been marked out in three languages: English, Urdu and Hindi. 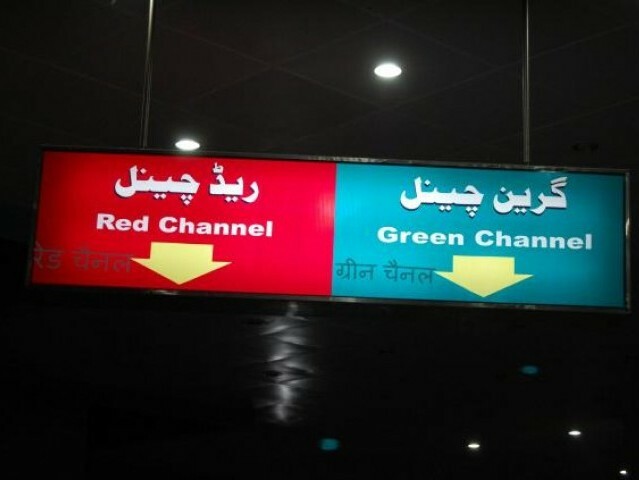 Among those sign boards sporting the Hindi script include ‘Green Channel’, ‘Red Channel’, ‘Immigration’, ‘toilets’, ‘drinking water fountain’, ‘Customs’ and ‘waiting hall’. An official told The Hindu that they had used Google Translate to translate signs into the Devanagri script. New agreement allows Pakistanis over 65 to arrive at Wagah border, apply for a single-entry Indian visa. In Jaipur they refused to register us, saying Delhi was mentioned first in visa so we must register in Delhi first. Businessmen hope items traded through integrated checkpost will be increased. … Hindi and Urdu markings (not just Hindi)…. !! Oh no! How stupid is that?!! Google translate is not at all accurate. Couldn’t they afford to hire a translator? urdu was already there. don’t put comments just for the sake of it. Couldn’t they afford to hire a translator? From where? Is any Hindu left in Pakistani Punjab? I think its a step in the right direction. The cold looks between the two countries seem to have thawed a bit. When will they open up all the Hindu temples and places of tourist interest like palaces etc., I am dying to visit Pak .I can visit today too but then who will provide me security. I think its a step in the right direction.Both countries should open up places of common interest like religious places/ palaces etc., That will thaw relationships a bit more . Grow up. Hindi is not only spoken by Hindus. Many Muslim Indians can not read Urdu. They can read Devnagari. Indian consulate or embassy would be a good source. I am sure they could put them in touch with a reputable translator they could work with either in person or via the net. Dont be ridiculous. Hindi is not just the language of Hindus. There are many people in Pakistan who still read and write Devanagri. I have relatives in my family who can read and write Hindi. Its hard to imagine that Pakistan would have nobody fluent in Hindi. Using google translate is just a sign of laziness and incompetence, two things that every Pakistani has come to expect of your lovely democratic government. Many Hindus in Pakistan. Try to visit Sindh. Even Muhajirs in Karachi can read/write Hindi. Newsflash! Hindi script seen in Pakistan for first time since 1947…LOL. What’s the big deal, countries put signs in other languages at their border crossings all the time. But then I forget, these are no ordinary two countries. Dear ET, I read the news in ‘The Hindu’ on the very day it was published. Then I checked Pakistani websites,nowhere was it reported. Now only you have come up with it and that too by making reference to ‘The Hindu’ which is an Indian newspaper. This is something that happened in Pakistani territory – Why can’t your guys be more proactive in presenting the world (including India), the softer side of Pakistanis. Ever heard of law of attraction? It is a sad state of affairs when a nation of 180 million people with Vedic roots does not have a Hindi scholar This is an indictment on the deterioration of the educational system in Pakistan. I wonder if LUMS has a languages department where they teach Hindi and other South Asian languages. @Umer: Hindus in Pakistn never spoke Hindi. They were mostly Sindhis and a few Punjabis. They can understand but writing and reading is a diff thing. I must say that’s a nice joke! My great grandfather taught Sanskrit at Lahore University just 80 years ago in 1930-ties. The demographic, cultural etc changes that has taken place in Pakistan in the last 70 years are without any precedence . @Umer: There are plenty of bilingual people in India that can read and write in both Urdu and Hindi. IF this simple service had been requested, I am sure Indian foreign ministry would have been happy to oblige. not all indians can read or write hindi. they didnt need to go very far, could have quietly sneaked over the border and had some indian official translate before jumping back on to your own turrf. Come oN yaar – hindi ki baat ho rahi hain aur apne apka ocean sey deep friend China ko yaha bhi import kara diya ? Urdu is nothing but Hindi with a few Farsi and Tukhi nouns written in Arabic script. I wonder when Pakistan will speak in their NATIVE languages rather than simply emulate India, Iran and Arabs.